Evan grew up playing and working at golf courses in the Snoqualmie Valley. 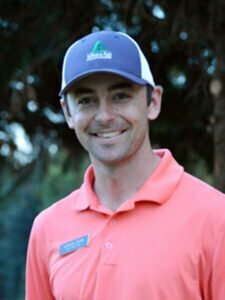 His first lessons were at Mount Si GC, where Head Professional Matt Campbell inspired him to see golf as a fun and cool sport. His first job, at 14 years old, was at Twin Rivers GC. He played D3 college golf at Claremont McKenna College in California. After college, he worked in real estate for 5 years before finding The First Tee in 2009. He has been the Program Director of The First Tee of Greater Seattle since 2012. “I’m working diligently to become a PGA Professional and am currently serving on the WWC PGA Player Development Committee,” Evan said of his immediate career goals. In 2016, Evan won a Yamaha Player Development Grant from the section. He used this grant to provide free clinics to parents of The First Tee golfers. He had noticed that many families of the kids were not golfers themselves. The mission of The First Tee is to serve youth, but many parents had asked about instruction for themselves. “When youth become regular members in our program, parents develop a desire to learn and play as well, so this opened the door for them to learn from a qualified instructor. If both parent and child are learning the game together, they have the opportunity to spend more time together and strengthen their relationship. Not to mention, they are more likely to keep playing into the future. By offering these adult clinics, we are not just training more golfers, but actually creating golf partners for life!” said Evan. The First Tee program was not structured to provide instructional opportunities directly for parents, but this did not deter Evan. He, along with Tony Wilkins and Steve Wozeniak, Head Professionals at two of the locations where The First Tee of Greater Seattle is held, came up with a plan. They arranged for a series of clinics to be held on each day of the chapter’s seasonal “Week 9 Championship,” and during each division of the tournament, so that parents could check their son or daughter in for the event, attend their own Get Golf Ready style clinic, and then return to watch their child finish and the awards ceremony. The First Tee of Greater Seattle offered the clinics for 40 parents of youth in the program over the course of two days, at two facilities. “Thanks to the grant we received this year, we were able to pilot this project and have exactly the cushion we needed to be able to offer it and provide scholarships and financial aid to parents who needed it,” he said of the program. The feedback from the parents was very positive. “I’ve never played golf so I was a little nervous to try, but the pro was so nice and helped me [with] my swing. Now I think I’m ready to practice on my own and try to keep up with my daughter!” said one parent. “It was fun to meet other parents and learn [golf] with them, since all of us were pretty new to golf!” said another parent. Evan created a Best Practices document for the program.